Disclosure: We received a review copy of The Switch Witch and the Magic of Switchcraft for inclusion in the 2016 Halloween Roundup. AVAILABLE AT: Available nationwide at Target and specialty stores as well as switchwitches.com. DESCRIPTION: Award winning author Audrey Kinsman brings a healthy Halloween tradition into the mix with The Switch Witch and the Magic of Switchcraft. 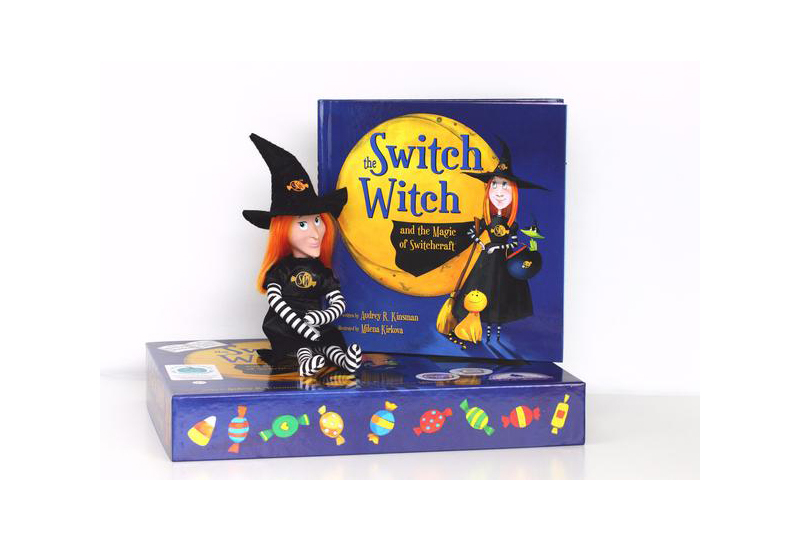 The Switch Witch hardcover book and Switch Witch toy will encourage and reward children ages 3 and up to switch out their pounds of Halloween candy for the season’s must-have toy or book. Switchwitches.com is an interactive website created to support teachers and families as they promote health, wellness and interactivity throughout the Fall. The concept came about when one of her own sons was trick-or-treating. After seeing his disappointment in knowing that he would not be able to eat most of the candy due to a food allergy, the idea of “Switchcrafting” the candy he was allergic to came to life. Partnered with The Teal Pumpkin Project, this toy/book combo set helps bring awareness to kids with allergies and help promote a better Halloween experience for all. Available nationwide at Target.com and specialty stores.